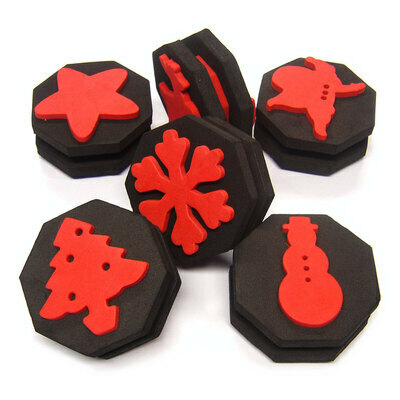 Create a festive celebration in every crafting class with our Christmas Stampers. Their lightweight and strong design make these stamps suited for use in nurseries, schools and even residential homes They provide a limitless range of design options for cards, poster or even just that masterpiece they're working on. A high-quality foam can be used with paints and inks of all kinds - a brilliant way to create masterpieces you'll be proud of. After use, they are easy to wash clean and store along with the rest of your Arts and Crafts stock. In addition and for easy grip, each of these stampers comes with an elasticated adjustable strap that fixes around your hand. Let their imaginations run wild.